Incidental Intelligence, 1963, plus A Wooden Computer? I don’t know much about the author, young Mr. Hanovich, other than that he wrote (very well) for the Thresher for several years and that he had quite a keen eye for the special brand of absurdity that thrives in academic institutions. His “Incidental Intelligence” column has been one of the highlights of my research on the 1960s at Rice. Bonus: It sounds like a joke my kids might make about how old I am, but this looks like a wooden computer to me. 8 Responses to Incidental Intelligence, 1963, plus A Wooden Computer? I would guess that the case has simulated wood-grain contact paper on it. It’s an old one, evidenced by the 8-inch floppy drives. Almadenmike’s link shows that the Horizon had 5-1/4″ floppies, not 8″. Oops. No, it’s really wood! I touched it. I had a good friend who worked at NorthStar for a few years. Thanks, Mike! Do you think we should keep this? I’d say ‘Yes’ if there was interest in having hardware for future exhibits on “Computing at Rice.” Folks in the future will amazed at how large the early PCs were … and it should also be useful to see real artifacts that can teach students about the impact of features, design, standards and business strategies in the success (and failure) of emerging technologies. If not, I’d consult with the Computer History Museum here in Mountain View, Calif. 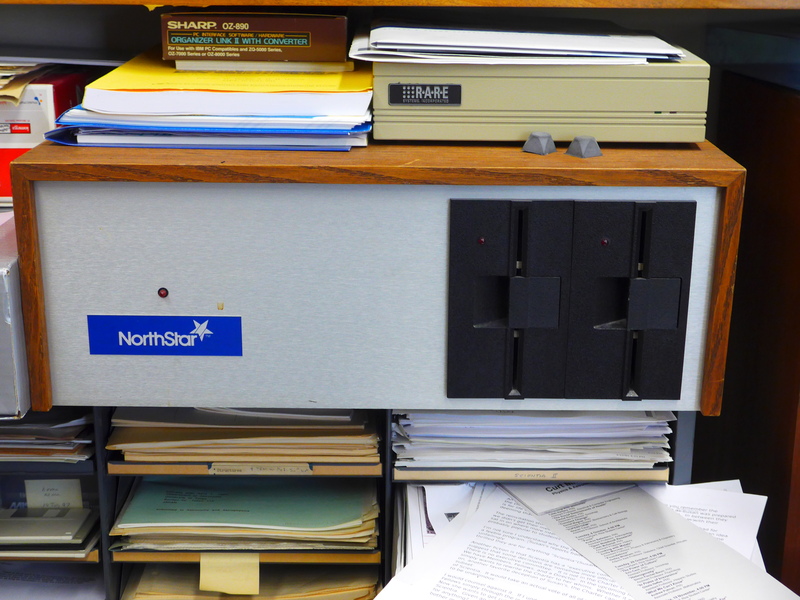 This particular NorthStar model is not on its “Wish List” (http://www.computerhistory.org/artifactdonation/) … but it’s also not on its “Unneeded Items” list either (http://www.computerhistory.org/artifactdonation/#step2). I’m sure the CHM staff would be very helpful to fellow preservation professionals. BTW, the latter page mentions a Houston Computer Museum, established by John R. Keys Jr. (http://www.hlctm.org/index.htm). But its website and Facebook pages haven’t been updated since 2012, so it may no longer be a going concern.. Wooden cases are fairly common on audio and electronic gear, especially from this time period. Whether for non-conductivity or aesthetic reasons, or both (my guess is both, plus it might be easier to fabricate an exact-size case from wood for a small manufacturer) I don’t know.